Below is a FAQ which applies to the $429.99 SBG Custom Katana Series. It does not apply to other Custom Sword lines we offer except in the most general way and is specifically directed to and about questions regarding this line only. Question: How long does it take to get my order once I have made my design? Answer: Generally speaking, it takes around 90 days between when we batch until when your order arrives. Some customers may end up getting theirs earlier and some will take slightly longer due to reasons such as customs clearance delays, national holidays (Chinese New Year in particular can add an extra MONTH to the process). Naturally if there are any issues with the sword when we do our QC we will consult with you and may decide to have it remade, which will of course cause a significant delay (but better a delay than a sword that is not quite right). Anyway, the the length of time varies but we do our best to keep you informed of where we are up to and will always answer your inquiries within a few days if you want an update. Question: Can you make a longer/shorter blade or handle? Answer: Sorry, no. We tried this and it messed up our system and effected the entire batches delivery time. 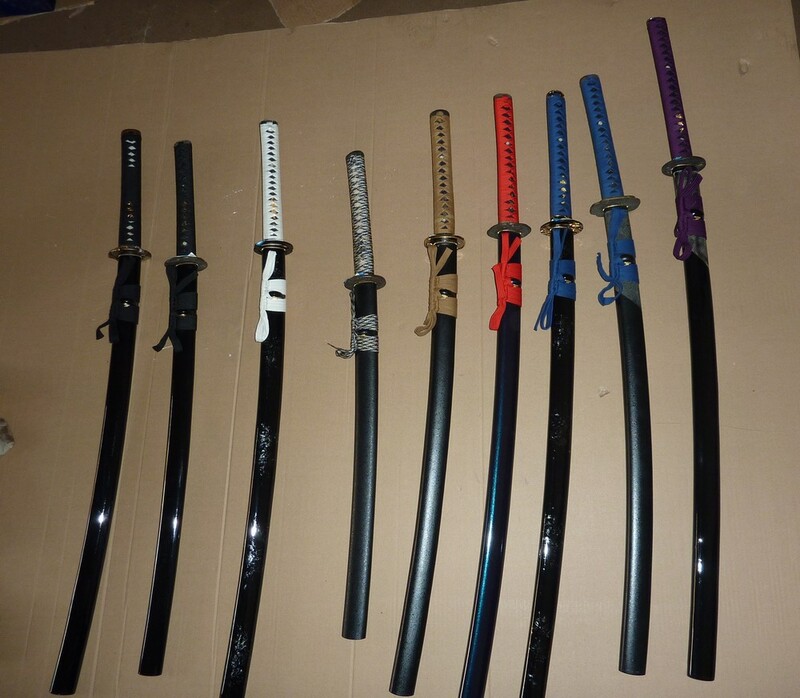 We have the option of a 27″, 28″ or 29″ blade (measured from the back notch of the habaki/blade collar, not the hand guard) a 22″ Ko Katana/Wakizashi option and a tanto. Anything that differs from this is outside the scope of our project and creates major issues for everyone else, so we don’t offer it anymore. Question: Can I select the color of the metal fittings on the handle (fuchi and kashira)? What about the menuki handle ornaments? Answer: For the project to work, we need to keep things as straightforward for the forge as possible and keep the options streamlined. As mentioned earlier, the more variables – the greater the chance of a mistake and the more complicated, time consuming (and expensive) it all becomes.. So when it comes to ‘fiddly’ things like handle ornaments (called menuki) we allow the guys making the swords at the forge a little leeway to choose something that fits the overall color scheme and theme you have selected (they enjoy doing this, and I like them to be proud of their work as they put more of their heart and soul into it! So in the end, its a win win for everyone). Question: Can you make me a copy of a copyrighted sword? Answer: Sorry, you might be able to find SIMILAR components from amoungst our stock selection, or maybe we can find you something SIMILAR, but we won’t intentionally try to match a copyrighted design. Question: Can you make me an unsharpened blade for training (a custom iaito)? Answer: Sorry, all the blades are sharpened by default. You can take the edge of yourself if so desired, but to keep things standard – all blades are sharpened. Question: Can I send you some fittings and the forge mount them on one of their blades? Answer: Sorry, it’s a bit too complicated and outside the scope of this project. If you wish to change the tsuba when you receive the sword, here’s a yahoo answers page on how this can be done. Question: I see you offer a folded steel option. Does this do anything to effect the blade and what does it look like? Answer: In the old days, a Katana was folded to try and even out the impurities in the steel, but of course with modern steels this is no longer necessary (and in some cases, can actually WEAKEN the blade depening on which forge is making them).. In short, the folded steel option just LOOKS a lot better, it doesn’t increase or weaken the blade, and yes – you can still see the hamon. Click on the image for a much larger pic. Question: What will be the weight and balance of my design? Answer: This is really hard to say – your choice of tsuba, the length of the blade and whether or not you wish to add a bo-hi (fuller) or not makes a big difference. We use decently weighted blades with some good meat on them, so if you want something fast an elegant you will need to use a solid styled tsuba to bring the balance back towards the back and a 27” blade. If you want a dedicated cutter, go for a solid bodied blade with lighter (we recommend iron) tsuba, 29” solid bodied blade. To get some idea, read our prototype report and testing result – the prototypes were 29” long blades, and the one with bo-hi weighed (bottom) weighed 2lbs 3oz with a point of balance 4.5” from the tsuba and the solid bodied blade weighed 5 oz more at 2lbs 8oz and was balanced at 5”. Question: What is a bo-hi? 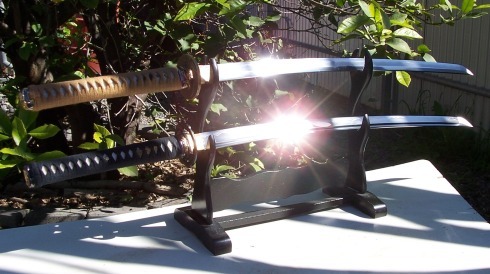 “Some of our Japanese swords come with the option to select either a ‘solid bodied’ blade or a blade ‘with bo-hi’. A bo-hi is essentially a fuller or groove that runs down the length of the blade, lightening it and changing the balance point to make it a bit faster and easier to wield. A by product of a Katana with bo-hi is that it makes a great ‘Tachi-Kaze’ (sword-wind-sound) when it swings through the air, giving some nice feedback on the angle and speed of your cut. At the end of the day then – if you want a real ‘choppper’, select the solid bodied blade. For a sword with a little more finesse, go with the bo-hi. Naturally this also applies to the custom Katana (even more so). Question: Can you make a quick summary of the order taking process? It’s a bit different than what I am used to, I don’t fully understand it..
Answer: Sure. We make the swords in a large batch 3-4 times a year, so when we email you that we are taking orders (a period that usually last a week or two before we reach the maximum number of orders the forge can comfortably handle) – you use the form and pictures on the sales page here to enter the details of your design and then add it to the cart. If you want any of the optional extras (such as leather ito, folded steel, stuff that isn’t at all necessary but makes it just a little more personal) you put these in your cart, buy now securely via paypal, and then – just wait. We will send you updates at least 3 times during the process. The first one confirms that your order details are correct and show you a quick mock up of what your sword might look like with a computer generated graphic. The second update lets you know we have batched all the orders and the forge is about to start work on your design. At this stage, the order is considered locked in until completion and no changes are possible as it just messes with the forges workload and slows things down for everyone else. From here, everything happens individually and you are updated until you receive the tracking number for your order or with any additional updates as required. We do our best to keep you informed (plus you are free to request an update anytime – just email). Question: What happens if I don’t like the sword when it comes in or wish to cancel my order? Because the money for each sword is sent to the forge to make the swords (there are few, if any, credit terms available in China) we ask that you commit seriously to the sword when buying just as we commit seriously to making it for you properly, and looking after you if there are any problems. If you absolutely MUST cancel once the forge has started work on your sword, we can probably work something out to help you, but please only do this as a last result. Before buying – if you are not able to be patient and serious, custom and semi-custom swords are probably not for you (in the case of true custom swords, some people need to – and do – wait YEARS). Question: What kind of quality control do you have on these? b) that all the customizations have been done right (this is also checked at the forge twice before they go out, but this extra layer makes a big difference). If something is still somehow missed, let us know when you get it and we will get it fixed to your satisfaction. Whatever is necessary, we will do it. I think that is what makes it different than trying to buy from a custom sword maker on ebay direct from one of the forges in China.. Question: Can you ship to countries outside of the USA and Canada? Answer: Yes. We offer FREE SHIPPING to all US and Canadian orders, with your sword securely packed inside a special styrofoam box. We also ship to some selected international locations, though as these days it is getting harder and harder to ship swords overseas, this list is a bit limited and I am afraid that if your country is not listed there, we cannot ship to you directly (as such, you may wish to consider using the services of a third party shipping service like the one explained on SBG here). The price of shipping in this case is factored in to the cart and typically around $100 to $120 via UPS. IMPORTANT NOTE FOR ALL ORDERS: Please also include a daytime contact telephone number when you order in case there are troubles during delivery to provide to the courier service that will deliver your sword in case there are any difficulties during delivery. Question: Where are you up to at the moment? When will be the next batch of orders?